This delightfully dreamy dragonfly will add beauty and wonder to your bracelet as he soars round and around leaving a sparkling trail of dreams in his wake. I have always been fascinated with dragonflies. Their shimmering iridescent wings, elegant beauty and graceful dancing captures the imagination and it is easy to understand why dragonflies are loved in many cultures. 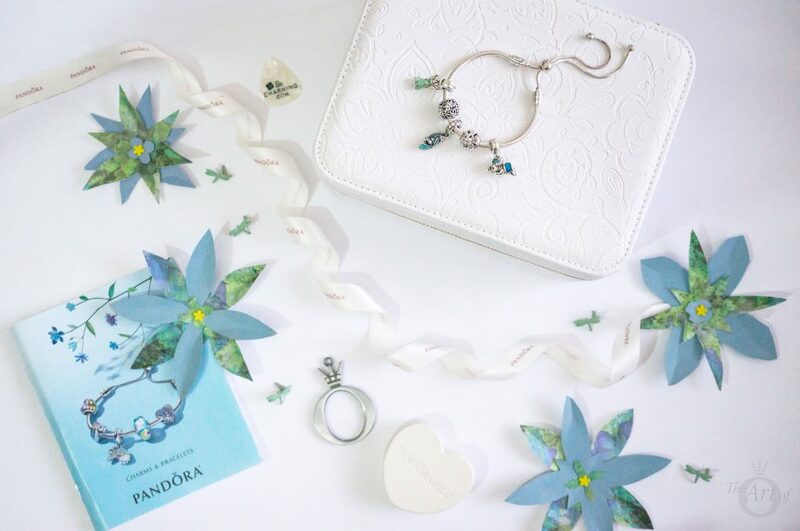 So of course the gorgeous PANDORA Dreamy Dragonfly (797025CZ) charm from the 2018 Spring Collection was a definite must have for me! At first glance, the Dreamy Dragonfly charm appears very similar to the Galaxy (791388CZ) charm as both have criss crossing silver strands and sparkling cubic zirconia stones. 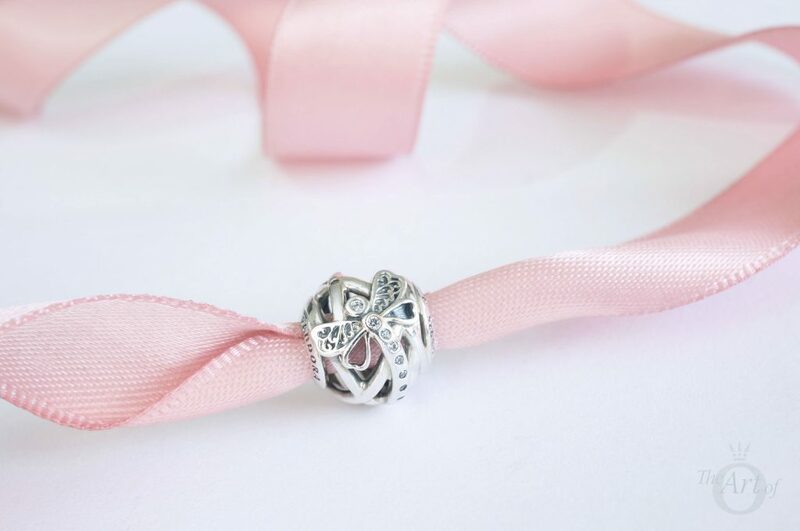 However a dainty dragonfly graces the top of the Dreamy Dragonfly charm and its glistening body merges into the silver thread. The Dreamy Dragonfly charm is incredibly shiny and other than the dragonfly element itself, the charm has very little oxidisation. The larger two of the dragonfly’s wings contain an intricate design with oxidisation detail filling the imprint. One of the dragonfly’s smaller wings is open and the second is oxidised in the middle. The shimmering stones which decorate the dragonfly’s body, blend seamlessly into the smooth, silver ribbon on the Dreamy Dragonfly charm. The space between each gem gradually increases, creating a wonderful effect that suggests the whirling dance of the dragonfly. 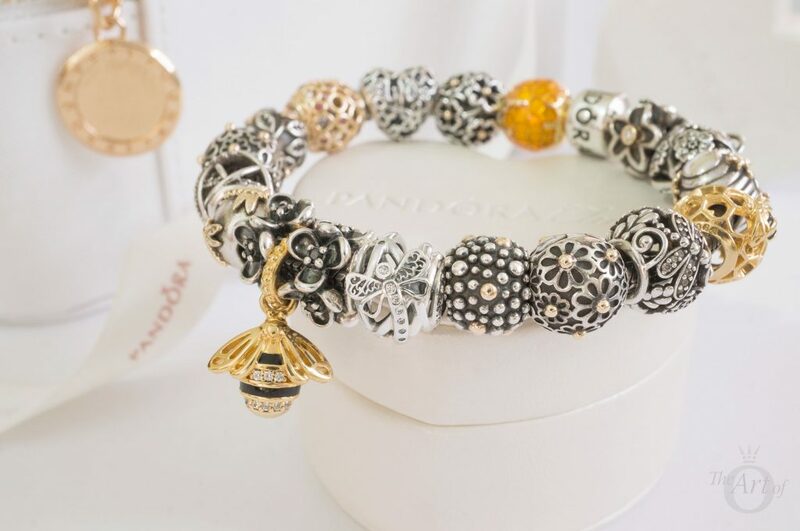 The new PANDORA hallmark ‘P2 S925 ALE’ is stamped around one of the openings on the Dreamy Dragonfly charm. 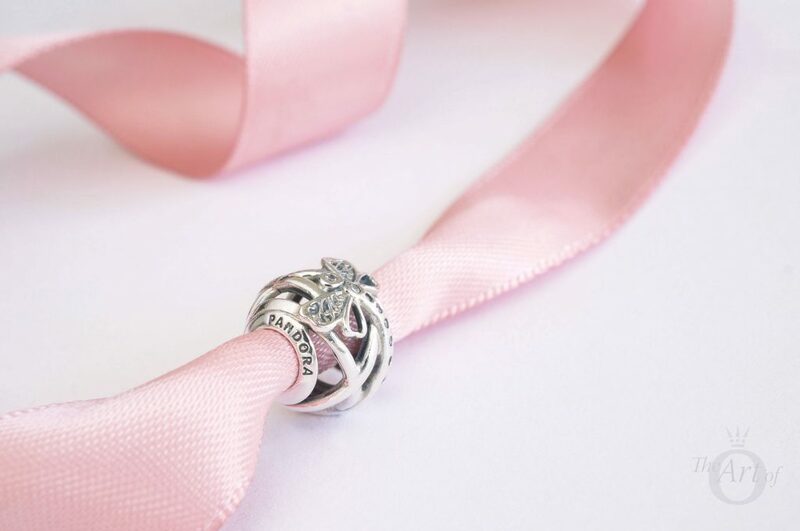 The standard ‘PANDORA’ hallmark is engraved on the opposite side of the Dreamy Dragonfly charm. I can still only see a dragonfly, its wings as thin and light as silk and its body the color of rainbow. In my first styling of the Dreamy Dragonfly charm I used a rainbow of Murano charms to replicate the shimmering colours of a dragonfly. The classic PANDORA Moments Bracelet (590702-HV) and Ribbed Clips (790163) provide a simple understated beauty for this look. Nature themed openwork charms alternate between the pastel shades and their lightweight feel contrasts against the solid Murano glass. The new Promise of Spring (797046) charm compliments the style wonderfully with it’s little beaded dragonfly. The cubic zirconia laced Dazzling Daisy Meadow (791492CZ) and Dragonfly Meadow (791733CZ) charms sit either side of the Dreamy Dragonfly charm and the Butterfly Garden (790895) and Floral Padlock (791397) charms complete the wild garden theme. The rainbow trail stars with the Pink Glitter Murano (791670) followed by the sweet Pink Field of Flowers (791665) and the retired Pink Butterfly Kisses Murano (791621). 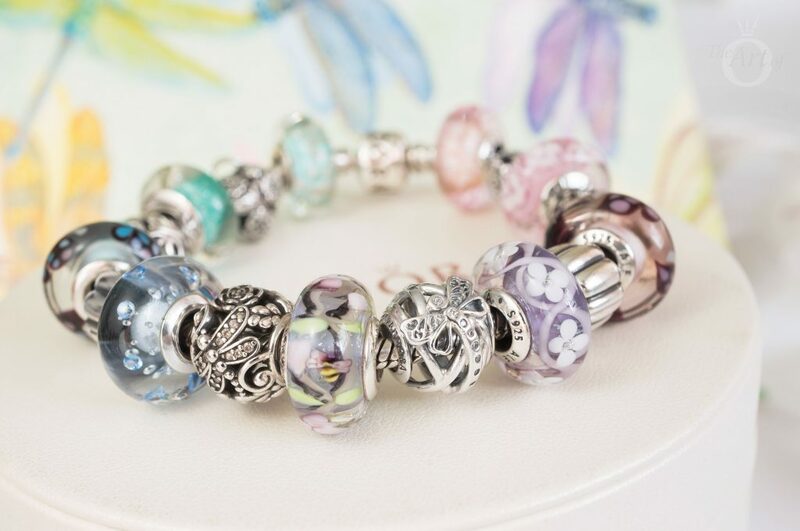 The Purple Field of Flowers Murano (791667) blends into the gorgeous Enchanted Garden Murano (797014) which melts into a cool blue with the Ice Drops Murano (796365CZB) charm. 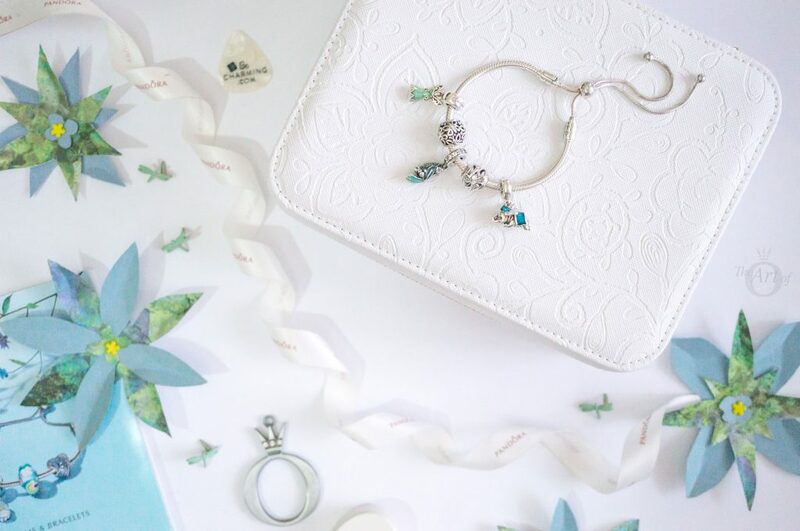 The hand painted Blue Butterflies Kisses (791622) softens the vibrant Disney Jasmine’s Signature Colour Murano (791648) and the Mint Glitter Murano (791669) charm holds the gold at the end of the rainbow! Advice from a dragonfly; Spend time near the water, be colourful, enjoy a good reed, zoom in on your dreams, appreciate the warm days and wing it! The relaxed Sliding Bracelet (597125CZ) with its boho vibe is perfect for this quirky group of friends! 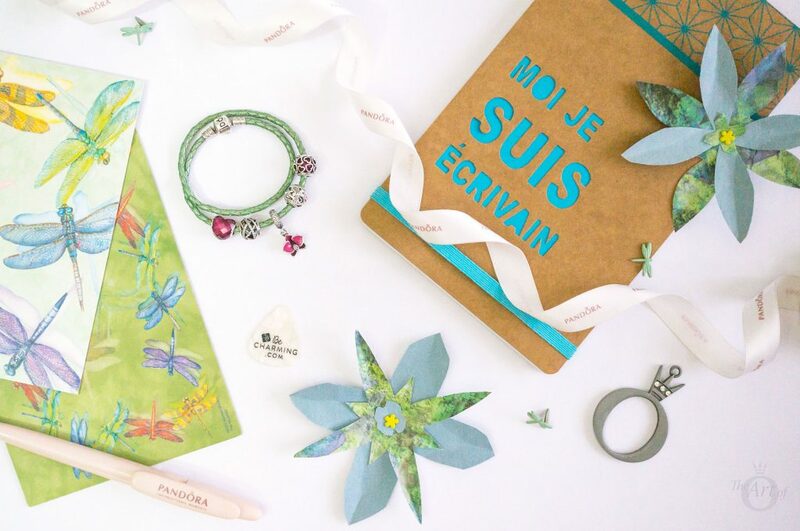 The gorgeous green Tinker Bell’s Dress (792138EN93) charm mingles with the brilliant teal and turquoise of the Tropical Parrot (791903ENMX) and Disney Flying Dumbo charms to create the colour of dreams. I love to see the sunshine on the wings of the Dragonflies... there is magic in it. Wings are of many kinds.. dragonfly's serene wings, wings of albatross, lovely wings of humming birds, tiny wings of a fly or a bumble-bee-wings; and when they fly, they fly their best according to their ability of flying. We should not underestimate the size of those heavenly wings. 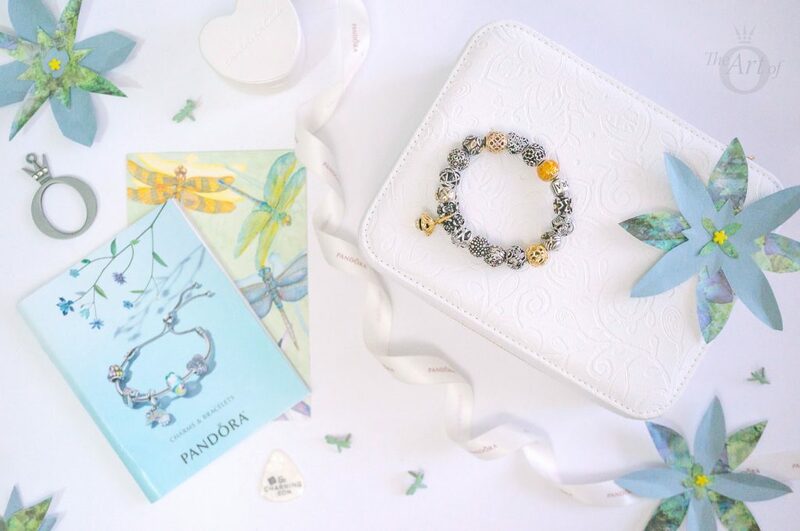 Heavenly wings of many kinds fill my third styling set on the PANDORA Moments Oxidised Bracelet (590702OX). 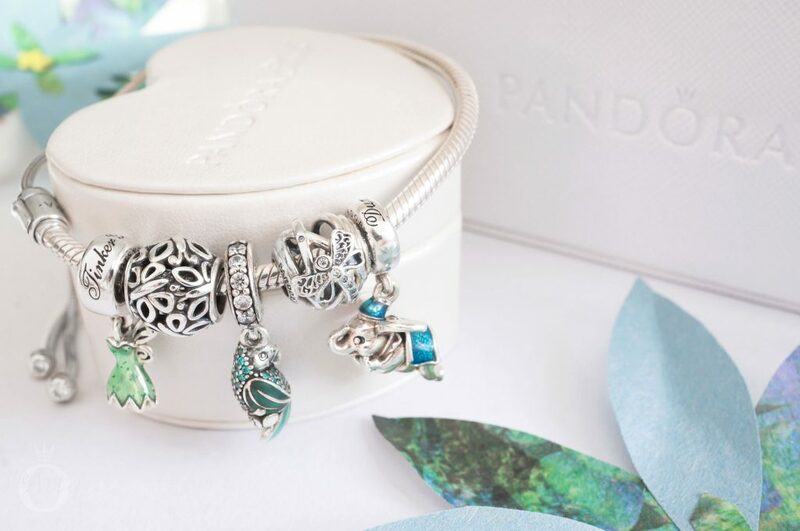 The mixture of PANDORA Shine, two tone and silver charms forge an exquisite ensemble. 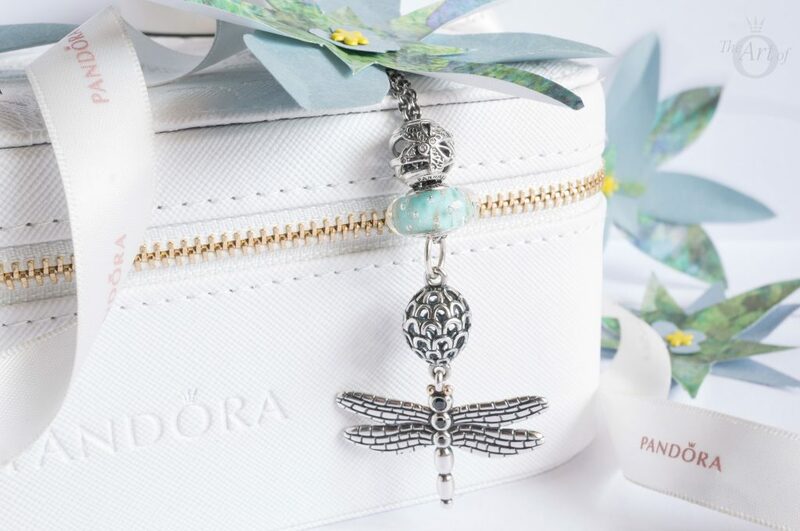 The PANDORA Shine Queen Bee Pendant (367075EN16) holds prime position with her lustrous lace like wings. 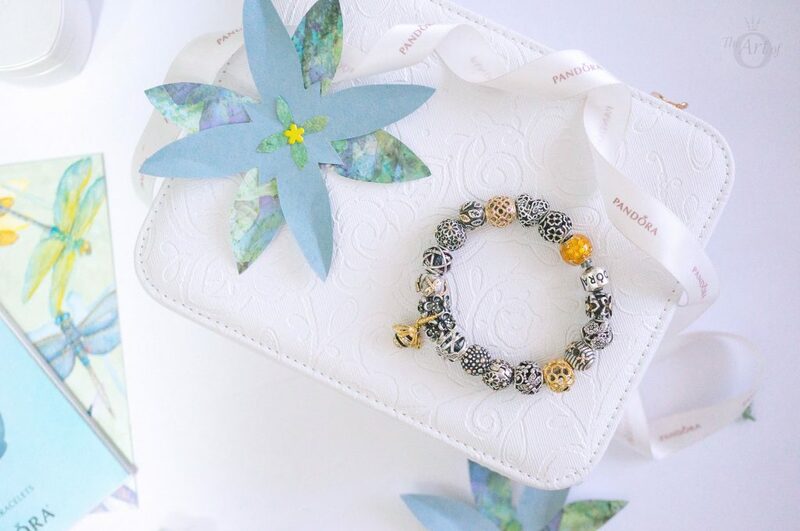 The glorious PANDORA Shine Honeybee (767023EN16), Golden Honey (767120EN158) and the retired Celtic Circles (750811TPK) charms provide balance and the magnificent two tone Dragonfly (790898) creates symmetry opposite the Dreamy Dragonfly charm. Magic is seeing wonder in nature's every little thing, seeing how wonderful the fireflies are and how magical are the dragonflies. I am the dragonfly rising on the wings of unlocked dreams on the verge of magical things. 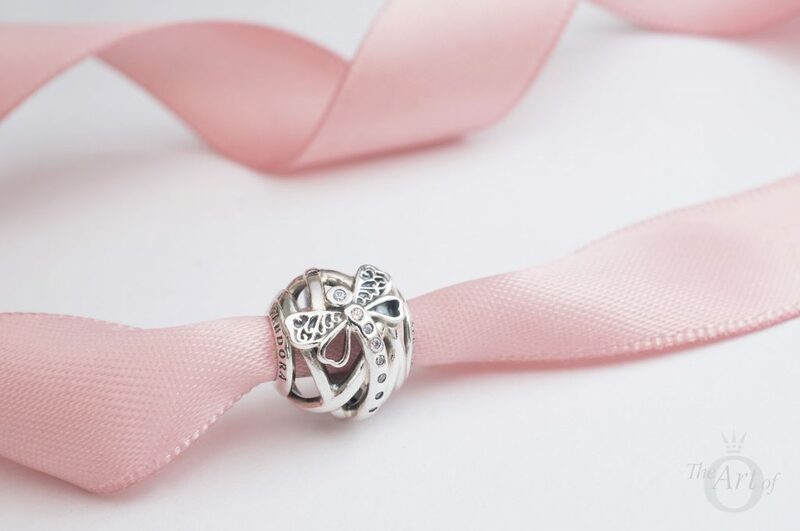 The twirling design of the Dreamy Dragonfly charm allows it to be worn on necklaces as well as bracelets. Paired with the tranquil hues of the Mint Glitter Murano (791669) charm, the Dreamy Dragonfly appears to gliding above its big brother, the handsome Dragonfly Pendant (390336CZK). This alluring combination, evokes memories of hazy days spent walking along the riverside with the hum of bees and quack of ducklings in the distance. Despite its dark veins, the transparency of dragonfly’s wings assures me of a pure, innocent world. I feel the fluttering of dragonflies, summer creatures that have no use for words. Their love as a dragonfly, skimming over echo park, stoppin to visit the lotus. Eating dreams and drinking blue sky. In my final styling, the Light Green Double Leather Bracelet (590705clg-d) provides a grass like backdrop for this summery look. The delicate Galaxy (791388CZ) charm with its entwining silver threads, mimics the Dreamy Dragonfly charm, like a rippling reflection in a river. Bright fuchsia pinks from the Shape of Love (796563NFR), Orchid Pendant (791554EN69) and the Cerise Encased In Love (792036NCC) charms create a striking look against the glistening green leather which is ideal for the summertime. 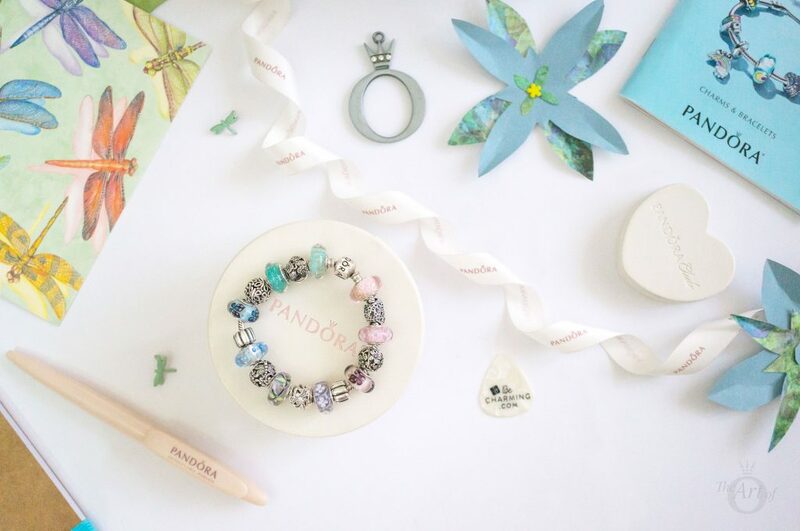 My verdict on the PANDORA Dreamy Dragonfly charm? It's what dreams are made of! 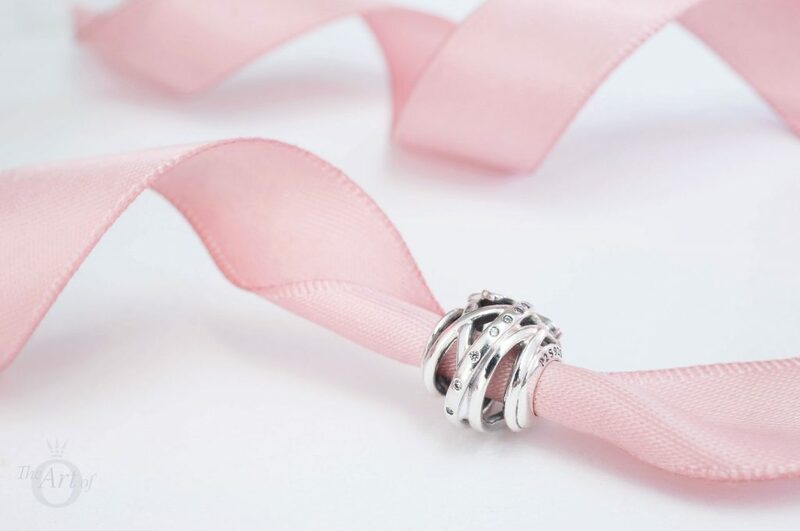 The Dreamy Dragonfly is a gorgeous charm that will get regular use in any PANDORA collection. As it isn’t a statement piece I have given it an 8/10 for wow factor. 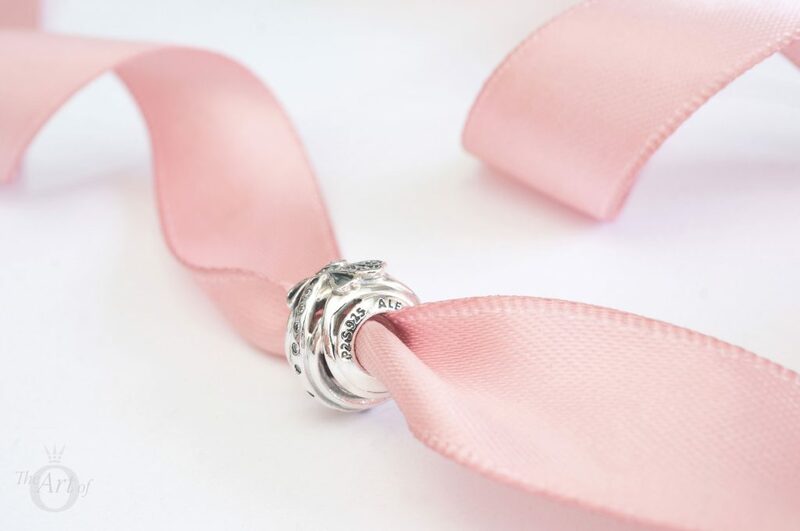 It is very reasonably priced and has a charming design which is quite versatile for various styles and both necklaces and bracelets. 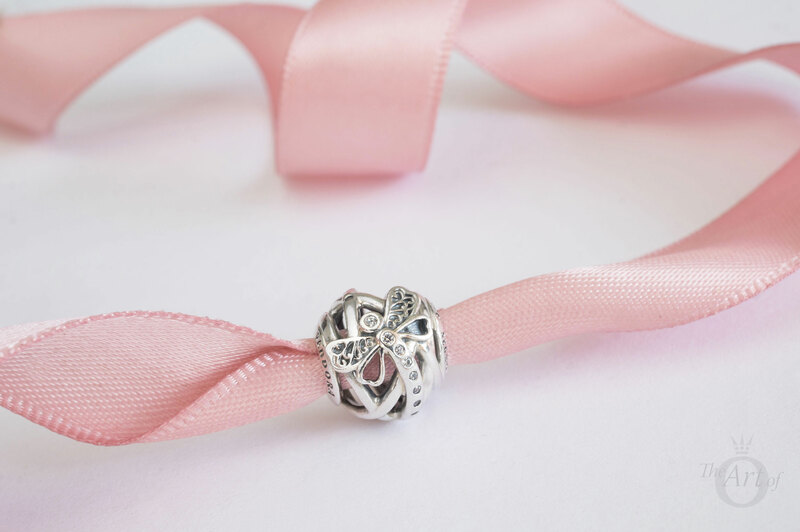 In the UK the PANDORA Dreamy Dragonfly Charm (797025CZ) is £30 and is available from the PANDORA UK eStore. Long been a fan of Pandora openwork charms. They are inexpensive and good “fillers” on bracelets. Love all your stylings. That is so true. 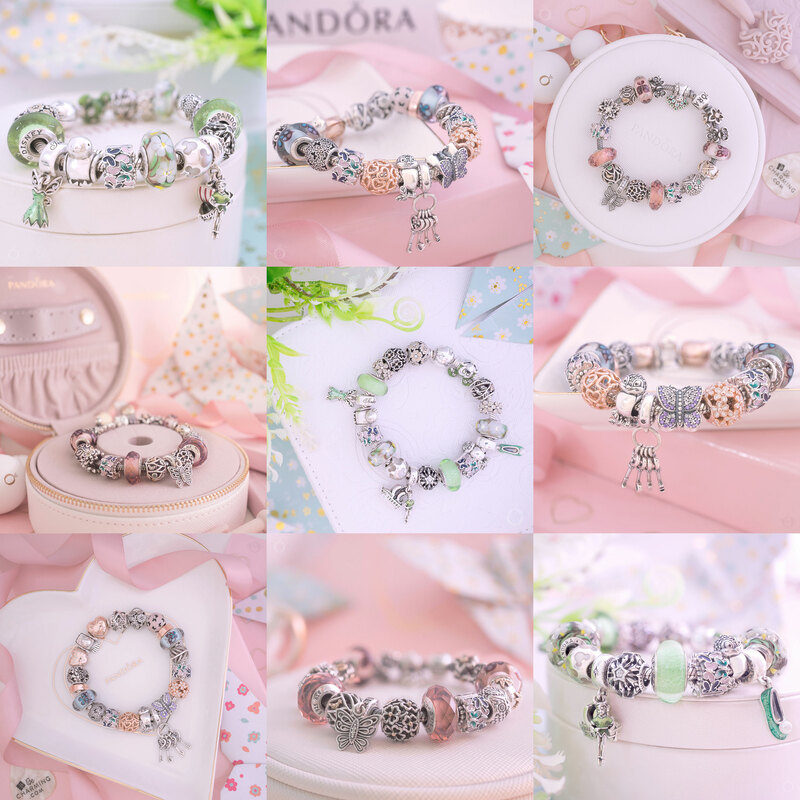 PANDORA Openwork charms are ideal as a nice little treat for yourself or a little pick me up! 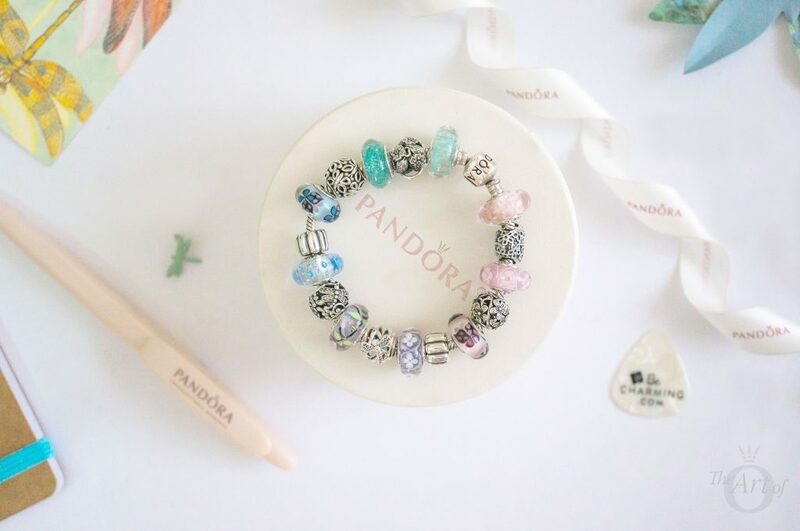 If you buy two of the same design you can also wear them on the PANDORA Compose Earrings. I have two of the Galaxy charms are they look gorgeous on the Earring Barrels. Thank you so much for sharing your story, it really made me chuckle! I didn’t know that dragonflies could bite people. They look so innocent! 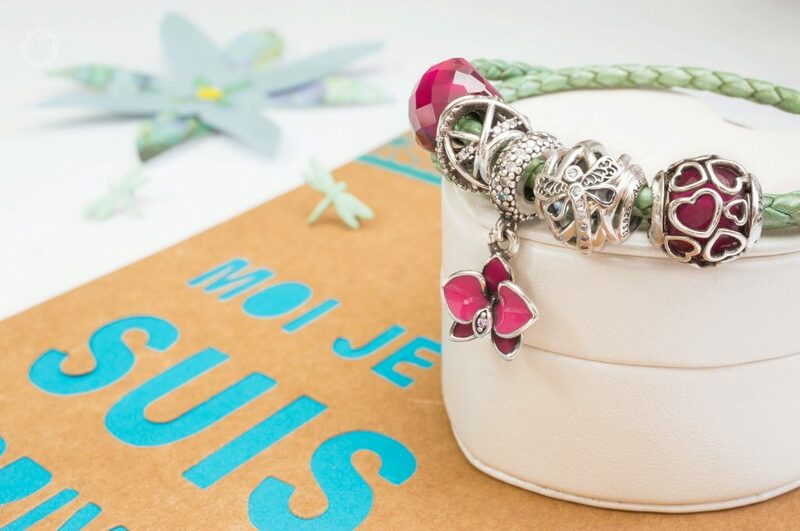 The Dreamy Dragonfly charm is a definite must have for you and your Moments Bracelet. Maybe if it wasn’t for the dragonflies on your first date there wouldn’t have been a second. They definitely are worthy of a space on your bracelet. I’d love to hear about the other moments you have symbolised on your bracelet. Enjoy the rest of your weekend and thanks again for sharing such a sweet story. On the instagram picture, the silver open charm with flowers, 3rd from the south to the east, which one is that?